When convent reared Lily Perrault arrives in Charleston from New Orleans in 1828 to claim an inheritance left to her by the mother she never knew, nothing prepares her for the shocking discovery that Kate Perrault’s legacy is not the respectable boarding house she expects, but rather the grandest gaming palace east of the Mississippi River. Before she can refuse her shameful bequest and return to the sanctuary of the convent, she uncovers yet another shattering secret. For more than twenty years her mother had plied a profession barely tolerated by the citizens of Charleston in order to hide an activity far more taboo. Operating beneath the very foundation of Swan House is a hidden station of the infamous Underground Railroad. The only way to protect the secret of Swan House is for Lily to assume her mother’s dangerous masquerade. She trades homespun for silk and becomes the Lady of the House. Follow her tumultuous journey as she rises above the taint of her mother’s tawdry past, discovers her true identity, captures the heart of the city, and finds love in the arms of her harshest critic, Doctor Paul Dupre. High on a cliff overlooking the sea, the great manor house of Belle Terre plantation sits empty as it has for more than half a century when the last member of the Ribaut-Marchand bloodline passed from this life leaving the vast estate in a preservation trust to the island of Barbados. Soft sighing winds whisper through the palms that surround it, barely masking the endless procession of waves that wash against the white sands of the deserted cove below. Overhead, a flock of seagulls circle and dive, then rise on the winds once again and venture further out to sea. Beyond the terrace that supports the upper gallery, a group of workers gathers up their tools and heads for the arbor. The sound of their native song echoes across the lawn as they set to work tending the flower beds that line the winding pathway back to the house. A bus passes through a pair of ornate iron gates in the distance and travels along a shell packed avenue toward the main entrance to the house. Led by a slender guide in a blue skirt and green blazer, a dozen tourists emerge from the bus and enter the house. For an hour the grandeur of Belle Terre will hold them spellbound as they try to imagine what life had been like when society had gathered beneath the massive chandeliers in the drawing room, and the hems of silk gowns whispered across the parquet floors in time to the music of ghostly musicians positioned in the gallery overhead. As sun sets on the island later in the day, the chief caretaker mounts his cart and guides it past a small herd of grazing sheep, on his way to the gates. They close with a harsh bang that echoes through the stillness. The sun descends even further as the old man climbs back onto the cart and leisurely retraces his path to the workers barracks behind the house. He dismounts and turns the gig over to his helper before entering his own modest dwelling for the night. As he reaches for his latch and steps into the room, he turns and looks hard at the scene before him one last time. They will come soon, emerging from the shadows of the arbor, unseen to all but themselves. The old man nods and softly closes his door for the night leaving the ghostly sons and daughters of Belle Terre to their benign haunting until the sun rises upon the land once more. The Last River Queen is the story of a great plantation house north of Charleston, and the women who presided over it from 1777 until 1985. Eden’s gate is the last of five great houses that were once a testament to a glittering society, and the monstrous evil, that existed along the river road. It is said you can still hear the thrumming heartbeat of these ghostly manors on a lonely night’s drive along a narrow two-lane road marked at intervals by gates that are now rusted shut and hidden behind walls of overgrowth that conceal what remains of the ruins in the distance. This particular summer night is humid and still. The smell of burned timbers intrudes upon the subconscious mind. A quarter of a mile upriver from Eden’s Gate, the charred columns of Burkefield rise against a ripening moon. Vines wind their way across the verandah and invade the house through broken window glass, then travel across buckled parquet toward a center staircase where they slither into every room. A soft breeze stirs the rotted cloth at one of the windows. Whispers of children’s laughter echo in the attic nursery above. No evidence of the square strength of Cottonwood, or the whimsical wrought iron galleries of the Hamilton bastion rise in the moonlight. Both have surrendered to the ravages of a fiery end, and the unrelenting assault of time. Professor Sonny Turnbull, a descendant of the Turnbulls of Three Fountains, and Charleston’s resident historian, will swear that on any given night you can hear the rustle of silk descending the staircase of his ancestral home, and eavesdrop upon the sweet words of a budding courtship in the crumbling lattice summerhouse of Eden’s Gate. And always, there are the mournful grieving sighs of restless souls who have been unable to leave their sovereigns behind to embark upon their final journeys. Only one, Eden’s Gate, wearied by time, defiantly survives to shelter a tortured and lonely woman who walks its upper gallery and dares to look beyond its weathered columns toward a world she can only dream about. 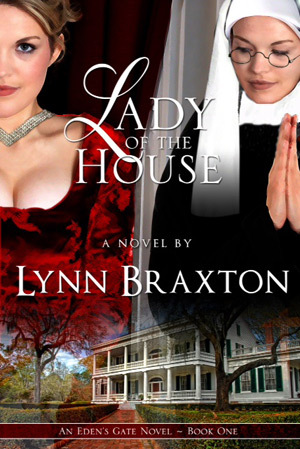 Lady of the House by Lynn Braxton. available on Amazon and through P.J. Boox.